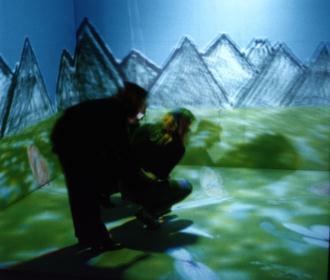 Crayoland is an interactive virtual environment created for the CAVE. It was first shown at the EVE 4 art show in May 1995. The environment is anti-photorealistic; it is built entirely from crude crayon drawings; the drawings are all flat 2 dimensional objects, but form a 3 dimensional world. 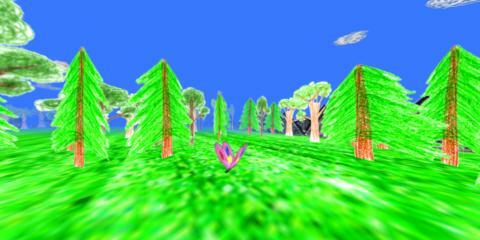 The world created for Crayoland is a 200' x 200' field, filled with trees, flowers, a lake and stream, and a house, and surrounded by mountains. 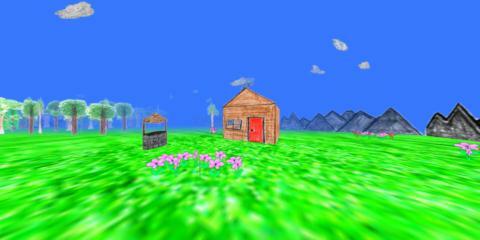 Small objects (the flowers and rocks) can be picked up and moved. 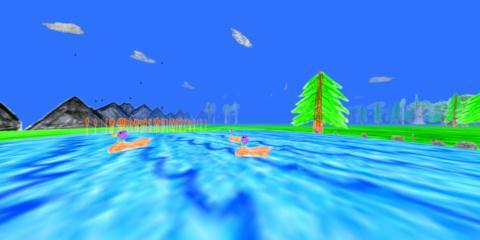 There are numerous positional sounds, such as the quacking of the ducks in the lake, birds chirping in the woods, and bees buzzing. When you walk through the lake, there are splash sounds from your footsteps. The environment is also inhabited by some independent creatures - bees and butterflies. The butterflies wander randomly about the field; if you pause near one and hold out your hand (the wand), the butterfly may decide to land on it and rest briefly. 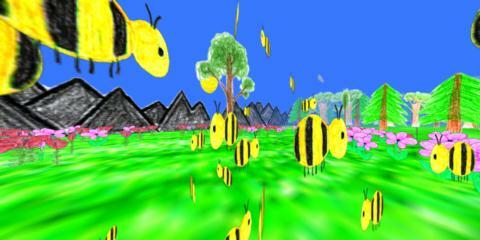 The bees normally spend their time travelling back and forth between their hive and the flowers scattered around the field, ignoring any people. However, if you are too nosy and disturb the hive, the bees will get pissed off and chase you. 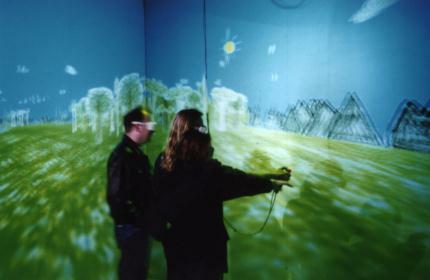 Note: This version is new, as of 1 March 2001. It is now based on the Bergen sound library+server, and also can be compiled under Linux. crayoland_vss.tar.gz - older version of Crayoland, based on the VSS 2.2 sound server. A VRML version of Crayoland can be found on my CAVE applications in VRML page. Last modified 1 May 2002.